A postcard showing the Ivanhoe Pinery, and a Google map image of the scene today. This is a post written for Bungalower. The history behind Orlando’s bungalow neighborhoods is a special part of their charm, and each neighborhood has unique stories about its origins. A great example of that is a story about College Park/Ivanhoe Village it was the cozy, residential community as it is today. Over 100 years ago, one man made Lake Ivanhoe the center of the U.S. pineapple industry and later turned the same land into one of Orlando’s first amusement parks. When Orlando got its start in the 1800’s, Central Florida could have been described as a tropical wilderness. Many of the pioneers who settled here were successful business people that relocated their entrepreneurial drive to Orlando. One such entrepreneur was George I. Russell. Mr. Russell, an early settler near Lake Ivanhoe, was a sharp businessmen and it could be said he had the foresight to build an amusement park here long before Walt Disney ever had the idea. George Russell moved to Florida in 1885 from Connecticut for the perceived healthy climate. He arrived in Tampa, but fell love and moved to Orlando after visiting here. Shortly after arriving, he and a business partner opened up shop downtown near Pine Street and the railroad tracks selling hay, feed, fertilizer, and grain. It enjoyed a great deal of success and was soon one of the largest businesses of its kind in Florida. Enjoying the prosperity of his new business, Mr. Russell bought a large parcel of land on the southern side of Lake Ivanhoe. There he built a large home (around where I-4 and the DoubleTree are today). The tropical fruits that could grow in Florida and not in other parts of the country fascinated many who moved here. The citrus industry was already well established by this time, but seeing pineapples growing around the homes in Orlando sparked an idea for Mr. Russell to grow and harvest them for profit. 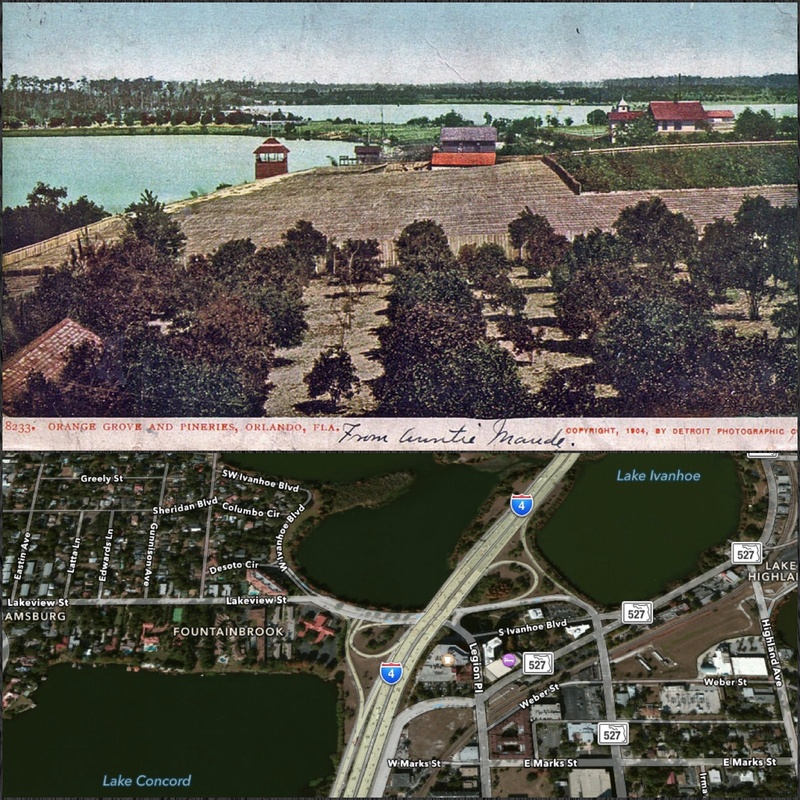 He developed his acreage between Lake Concord and Lake Ivanhoe into a pinery (basically a pineapple farm). At first, he planted the pineapple varieties commonly grown in the area, but soon imported varieties from Hawaii and Puerto Rico. In the mid-1890’s, the citrus industry was devastated by freezing temperatures. This created an urgency to protect his pineapples. Wooden sheds were built across the pinery and steam boilers for heat were installed. Mr. Russell found that the plants were not just protected, but thrived in the ideal conditions of the sheds and steam. He added additional pineries until there were over 20 acres of pineapples across the area. In 1900, The Florida Agriculturist proclaimed Orlando as “the Mother of the pineapple business” and noted Florida supplied most of the pineapples to the U.S.
An ad for Russell’s Pineapples in 1897 said the Ivanhoe pineries were “known throughout the United States as producing the finest fruit ever put on the market.” They became so popular that plants, while still planted in local soil, were carefully packed in wooden crates and shipped to Washington D.C. There they were planted in the White House Conservatory to grow and harvest for President McKinley to enjoy fresh Ivanhoe pineapples. The Florida pineapple industry quickly died out when more trade opened with Cuba. No longer as profitable, Mr. Russell got out of the pineapple business and turned his attention to his third Orlando venture, a water park. Water slide at Joyland on Lake Ivanhoe in the 1910’s. In 1910, he built Russell’s Point (also called Ivanhoe Park). 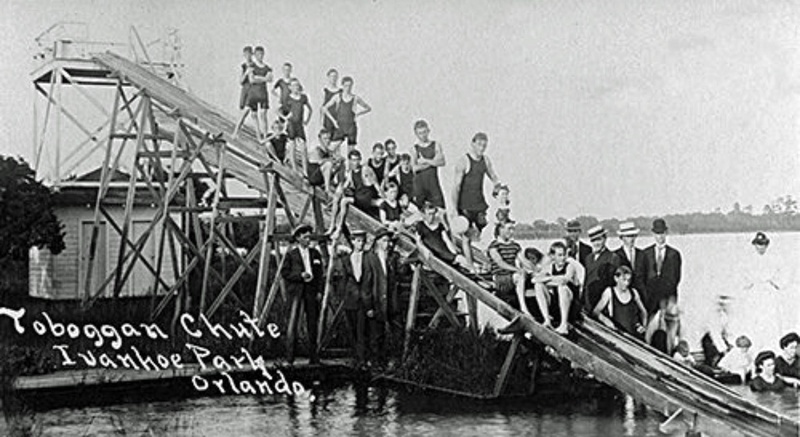 Orlando historian Eve Bacon described it as “an amusement and recreation park on Lake Ivanhoe, that became the favorite gathering place for Orlandoans of all ages.” This made the area the spot for indoor and outdoor fun with a dock, water slides, a dance hall, picnic area, and 50 boats for fishing and enjoying the lake. Movies – silent films at the time – were often featured. Russell’s Point was later called Joyland after a contest was held to rename to the popular entertainment location. The amusement park operated for about nine years. George Russell grew three successful ventures, the grain and fertilizer business downtown, the pineries, and then Joyland. The Lake Ivanhoe area that was a special part of Mr. Russell’s life would soon become home to many others. He closed Joyland and sold his 30 acres of property in 1919 to be developed into the subdivision from which College Park would emerge. 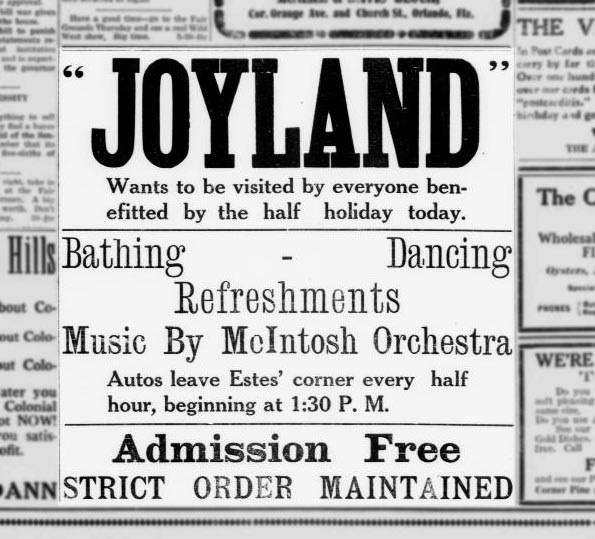 Love to hear about Joyland; I have to imagine that my grandmother (born in Orlando in 1909) and her family and friends visited the park. I only wish I had known to ask about it while she was still living, I have so many questions. Thanks Steve!